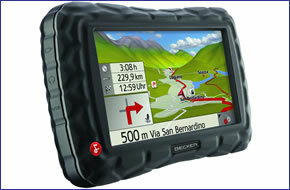 Becker Traffic Assist Z 100 Crocodile has been discontinued. Accessories, spares and parts are still available for your Traffic Assist Z 100. For the latest range of motorbike sat navs click here. The Becker Traffic Assist Z 100 Crocodile also features TMC (Traffic Message Channel) module for advanced warning of traffic problems in the road ahead. The Becker Traffic Assist Z 100 Crocodile advanced features include 'Lane Assistant' which alerts the driver to a lane change ahead of time. The Becker Traffic Assist Z 100 Crocodile is equipped with Reality View: nearly 4,000 directional signs on European motorways are presented true to life on the high-resolution display to make it easier to find your way. In addition the Becker Traffic Assist Z 100 Crocodile features an anti-theft PIN entry system. When the Becker Traffic Assist Z 100 Crocodile is switched on, a PIN must be correctly entered before the unit becomes operational. In others words: no PIN - no navigation. Without the correct PIN, the unit is useless to thieves. Cardo Scala Rider headsets are available to use with your Becker Traffic Assist Z100 Crocodile. The benefits of buying and using a Scala Rider headset with your Becker motorcycle sat nav are three-fold; 1. you can listen to sat nav voice turn-by-turn instructions, 2. listen to music and 3. communicate with other motorcyclists whilst riding (using the intercom when within range and mobile phone when out of range). The Becker Traffic Assist Z 100 Crocodile provides dynamic route guidance with TMC in Austria, Belgium, Denmark, France (free TMC only), Germany, Italy, the Netherlands, Spain, Sweden and Switzerland. TMC information can be accessed when route guidance is deactivated. Want to add accessories to your Becker Traffic Assist Z100 Crocodile model? We sell a vast selection of genuine Becker parts and accessories to view and buy click here.